Silverstream G-Force has been in the Silverstream show team and was Reserve Champion Adult Male at the 2009 Nationals. 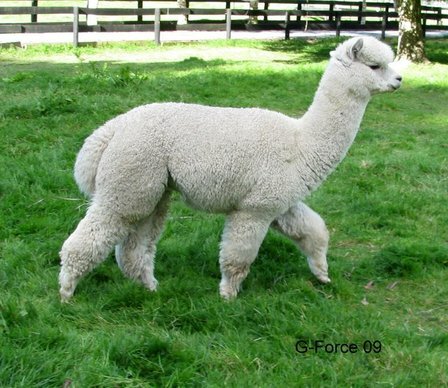 He was shown at Kumeu in March 2010 and took out Reserve Champion Senior Male and White/Light Fawn Colour Champion. At 2010 Nationals in October 2010 he was Champion Senior Male and at Whangarei, December 2010, he was Supreme Champion. He has some wonderful genetics. EP Cambridge Peruvian Caesar is Cambridge’s in-house male – you cannot access his genetics unless you purchase a female pregnant to him. EP Cambridge Jollette, the dam, has an incredibly fine and soft handling fleece and is by the well known sire Jolimont Commisario.